Dr. Parnassus (Christopher Plummer) is the oldest man alive, granted immortality in a pact with the Mr. Nick (the demonic Tom Waits) on the understanding that when his daughter Valentina (Lily Cole) reaches the age of sixteen, she will be taken by the Devil. 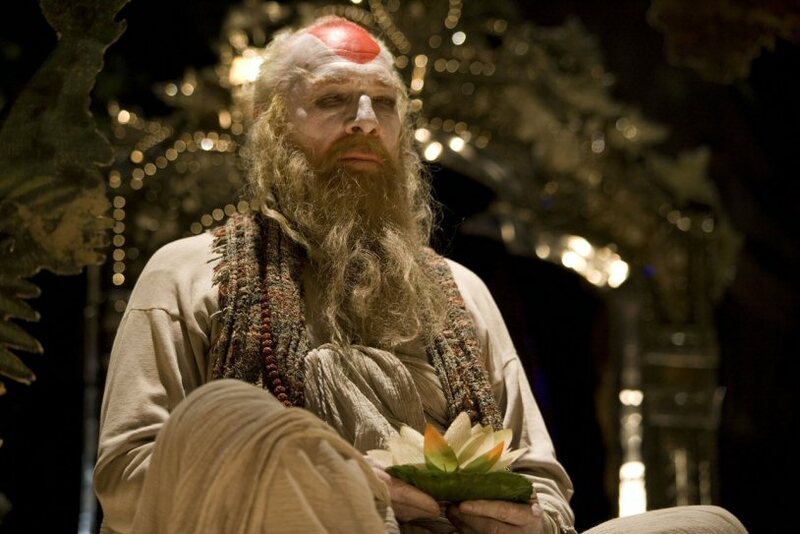 Parnassus spends his immortal life travelling the streets of London attempting to entertain its inhabitants, yet frequently failing even to amuse (I’m not exactly sure why – neither, it seems, is Gilliam). One typically rainy night, Parnassus and his daughter happen across a wretched figure dangling from the underside of London Bridge. Without question, they save the man, know as Tony (Heath Ledger), from hanging and adopt him into their ‘act’…and that’s where the film’s coherency ends. The remainder of the film’s narrative (and I use that term loosely) delves into Parnassus’ rich, surreal imagination by the way of a mirror, where stilettos litter the landscape, rivers become snakes and ladders strike upwards into cloud. In case I’m putting you off, I’ll just say now – you must see this film. Though there can be little argument that The Imaginarium of Dr. Parnassus’s fantasy sequences are at times as flabby and bloated as they are surreal and compelling (complete with slapstick humour and dancing, stocking-clad policemen), they contain more charm, invention and wit than anything seen in Tim Burton’s failed interpretation of Alice in Wonderland (2010). The London of Parnassus is saturated with the kind of magic that charmed Victorian England: street-performers with up-turned caps; crafty sleight-of-hand and the ‘double-bluff’; an old man with a painted face, suspended in meditation but not in mid-air, cross-legged on a podium of glass. The Imaginarium itself, complete with collapsible proscenium, amber stage-lamps and dark horses, rattles through contemporary London seeking out souls to save like a last, lost fragment from the era of the travelling shows. Gilliam’s film famously gained notoriety due to the death of actor Heath Ledger during principal photography, leaving a number of scenes incomplete (which now feature high profile stand-ins from Johnny Depp, Colin Farrell and Jude Law). Yet surprisingly, the (necessary) conceit of having Ledger’s ‘Tony’ change his face when he stumbles through the mirror into Parnassus’ imagination works well, underlining the skewed nature of his character, his propensity for deception and the implicit illusion of appearance and persona. Like Time Bandits (1981), Brazil (1985) and Twelve Monkeys (1995), Parnassus is a Terry Gilliam film to submit to, not struggle against. See it, and be surprised. Know the flaws, scratch your head and trip and fall into its blissful, anarchic confusion.